Toilets For Small Bathrooms – Space Saving Toilets - Toilet Found! What are the types of toilets that are ideal for small bathroom designs? Whatever small bathroom ideas you may have, the size and range of toilet types out there will amaze you. And you will have no problem finding a matching toilet that goes well with your bathroom design. Choosing the right toilet will save you space and still offer good aesthetics. And most of all, it’s comfortable to use for the whole family. So what are the space saving toilets out there that will fit your budget as well as your small bathroom design? Let’s explore them all in this article. But first, you need to determine the available space allowed for a toilet. This is crucial, if you don’t want your bathroom to look awkward with a toilet that is too big for the small space. Which is why the minimum space requirement is so important. You just need to work it out before shopping for a suitable toilet. The main dimensions are the Width and Depth (front to back). As these will determine the size of the toilet that is suitable for the space area. The height is usually less of a concern as the minimum ceiling to floor is 80″ (or 6.7 ft) in most building codes. This is more than enough vertical room even for a regular size toilet. Unless you plan to install the toilet under the stairs or some loft space with low height. Then be sure to position the toilet where you have decent spacing above your head when you stand up. Otherwise please scrap the idea of having a toilet in that space. It’s just not good for safety reason and unhealthy as well. But let’s not dwell too much into the minimum space rule here and lose sight of the main subject. While the size of the toilet is important, there are features you may also want to consider. Such as, ADA Compliant, Comfort Height and Water Saving toilets. These features are also available in compact toilets. So be sure to make a list of features you want when you go shopping for a small toilet. That will help you narrow down to more specific models and save precious time. List down all your criteria and you won’t go wrong when shopping for a compact toilet. Bathroom designers and happy users will tell you to go for the compact elongated bowl toilet. This is because elongated bowls are more comfortable (especially for men) to use. And they blend in well with any bathroom design. But bear in mind elongated toilets tend to be longer. So unless you have enough depth space, you are better off with a round front toilet. That will save you about 2 to 3 inches of front space. Otherwise you can opt for the wall-hung toilets which will save you even more inches. Another factor to consider when shopping for a compact toilet is the rough-in size. The most common size is 12″, which is desirable because you will have the widest range of toilets to choose from. But if space is really that critical, a 10 inch rough-in toilet may be another solution to consider. This will position the toilet further back against the wall saving you some depth for more spaces at the front. However, not all 10″ rough-in toilets are meant for saving space. Some will have the same dimension as the 12″ models. So be sure to compare the dimensions before you decide on one. If you are replacing an old toilet, you MUST get back the same rough-in size as your existing toilet. Changing of rough-in size is only when you are on a remodel or new build. If you have no issue with the depth space, an elongated bowl toilet will be a smart choice. But if width is a little narrow for comfort, you can still spot a few toilet models with a narrow bowl width. Typically, the bowl width of compact toilets come about 14″ to 15″ wide. Any larger, then you are probably looking at the regular size toilets. Any elongated toilet with less than 28 inches in length is considered a small toilet. But some manufacturers have it close to 29 inches and still call them compact toilets. So there really isn’t a standard to classify what is a regular or compact size toilet to begin with. It’s all about marketing, and you just need to get the best fitting toilet for your small bathroom. Always give your attention to the toilet dimensions and not what it is called. Here are a few compact elongated bowl toilet models to look at. They are based on real user reviews that ranked them the best small elongated bowl toilets. They are shorter in length compared to the elongated models. These compact round front toilets are good for spaces that are tight in both width and depth. It gives a squarish bathroom space the comforting curves that are pleasing to the eyes. However, some guys might not like the short front (no pun). Other than the shorter length, they have the same flushing power and efficiency as the elongated models. The tankless toilet has the benefit of a siphonic toilet with large water surface area and the clog-free washdown toilet. As the name suggests, it doesn’t have a tank attached. It uses an inbuilt electric pump and piped water for flushing, so it needs electricity to work. Not very useful if you live in an area with frequent power failure. Typically they have a bowl length which ranges from 25″ to over 30″. But don’t base your decision on just the toilet length, you need to also factor in the wall clearance, if any. For example, the KOHLER Numi K-3901 may have a length of just 25.75″, but you need a wall clearance of about 3.5″. That will take up more than 29 inches of space (front to back). The reason for this wide clearance is for the auto-opening of the seat cover. But not all tankless toilets need such wide clearance for the seat cover. At least not for TOTO Neorest. The biggest drawback is its high price tag. They belong to the high end range of flushing toilets. A standard model can cost any where between $1500 to $3000, not including installation. If you ever own one, you will never want to go back to the tank and bowl toilets. Users just love the feel and efficiency of these tankless toilets. Here are the 2 popular TOTO Neorest tankless toilets with bowl length shorter than 28 inches. Like the tank and bowl toilets, wall hung toilets are also gravity flush toilets. The difference is the tank is hidden behind the wall. It comes with a carrier which support the bowl and holds the tank within its metal structure. Wall mounted toilets are great space saver and less expensive than the tankless models. You can save up to 9 inches in length space, and you can set the height to anywhere between 15″ to 19″. So you get to choose between regular seat height or comfort height. There are concerns that it won’t hold too much weight, and over time it might just give in and fall. But in countries like Switzerland, over 90% of toilets are wall hung. And they can last for as long as 30 years without an incident. Many users love the sleek and clean look, that give a small space an open feeling, a sense of spaciousness. You will also love how easy it is to keep clean. The carrier is usually sold separately with the bowl. But you may also choose a different make of carrier to go with the bowl. The most well known wall hung toilet carrier is Geberit. The company produces a wide range of carrier systems to match bowls from other manufacturers. Installation can be a little tricky. As in the carrier must be carefully installed to avoid costly repairs later. Unless you know what you are doing, do not attempt to do your own installation. It is better to leave it to a plumbing company with experience installing wall hung toilets. 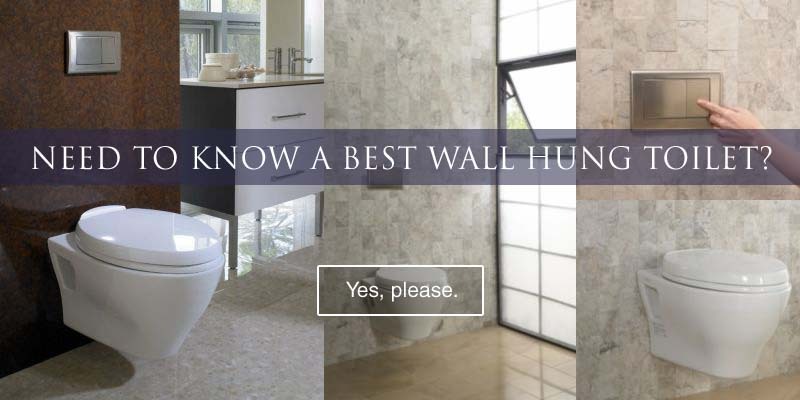 The best time to install a wall hung toilet is when you are building a new toilet or bathroom. This is because the sewer line is laid differently from those floor mounted toilets. So if you are planning for a new small toilet or bathroom, be sure to consider the wall hung system. When you are facing a tight space issue in your bathroom remodeling, may be you should look to the corner. Filling a corner space has always been a natural thing to do when space has become a rare commodity. If the corner is the only way out to optimize space for other bathroom fixtures, a corner toilet is your best option. It is basically a floor mount gravity flush tank and bowl toilet, with a triangular shape toilet tank. Obviously designed to fit a corner as a way out of a peculiar space limitation. But can you replace your existing toilet with a corner crapper? No you can’t. This is because the rough-in of the corner toilet is measured from both perpendicular walls (diagram right). Typically 12 inches from both sides to the center of the sewer outlet. A normal back-against-wall toilet is unlikely to meet the 12″ X 12″ rough-in of a corner toilet. So again you can only do it on a new build or remodel. So you intend to convert an unused space in the house to a toilet, and you probably don’t intend to make it permanent. Your best option is a macerating toilet, also known as an upflush toilet. The best thing about upflush toilet is, you can virtually install it anywhere. As long as cold water connection and electrical power can be tapped, and there’s no need for a drain pipe. But not any macerating toilet, it has to be this macerating toilet. Remember, we are on the subject of space saving toilets. So it has to be compact. With a length of only 17.5″, this upflush toilet will fit in any small space you’ve got for a toilet. Get the full feature review of this macerating toilet here. How Does A Macerating Toilet Work? Just like the tankless toilet, this little macerating toilet don’t have a tank attached. The water for flushing is supplied by a water line, and a pump with blades to grind solid waste into smaller bits. The slurry is then pumped out through pipes connected to the sewer line. The liquid waste can be transported upwards through the discharge line up to a height of 9 ft (hence the name upflush toilet). Perfect for a basement toilet and places where sewer drainage is not accessible. And like the tankless toilet, this macerator needs electricity to work. So you know the drawback when power kaput. Installation is not difficult for a plumber as the bulk of it are regular plumbing work. It doesn’t seem like a DIY job as it involves connection to the sewer line. Unless you are a qualified plumber yourself, you won’t want to risk an improper connection. And, you will also need an electrician to install a power outlet if there isn’t one at the chosen location. Again, a word of caution here. Unless you know plumbing and electrical code at the back of your hand, do not attempt to do the entire installation yourself. Always get professional help if you have to. And bear in mind this is not your regular flush toilet. Its piping are small 1 inch pipes that cannot handle anything other than macerated waste and paper. So be careful with what you dump into the bowl. Plunging is useless on this crapper. Proper use and care is a must to avoid expensive repair and maintenance cost. Video – How a Saniflo Macerating Toilet works and How to Install it. Have you got an idea of what toilet type to choose for your small bathroom? Leave your comments below if you know of a better solution and thanks for reading. Thank you for your very important comments. How can I install this kind of toilet on my small boat that is 36′ long and 10.75′ wide? I doubt you have the space for any house toilet on your boat, however small they are. You will need a minimum space of about 50″ x 30″.